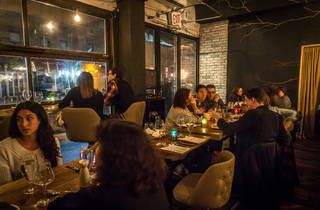 The name is definitely worthy of an eye roll, but dad-joke hokeyness is graciously absent elsewhere at Avant Garden, a virtuous vegan-restaurant detour for owner Ravi DeRossi, whose personal brand of New York locales (the fondue-dipping Bourgeois Pig, the rum-doused Mother of Pearl) have heretofore been imbued with a Baz Luhrmann loucheness. 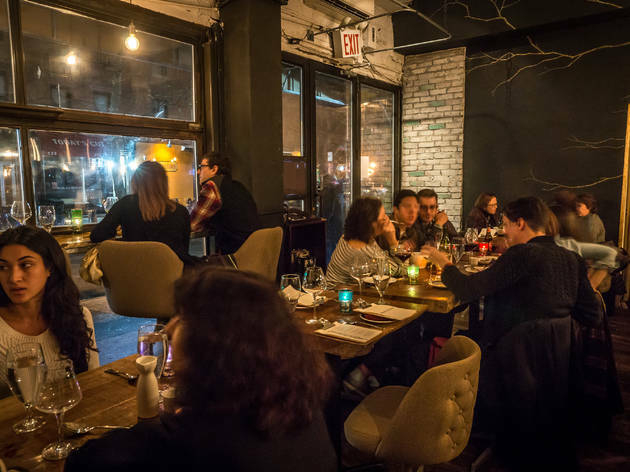 Decadence is dialed down in the 28-seat space—a petrified-wood counter forsakes velvet trimmings and tiki camp; raw tree branches hang above an open kitchen; and the restaurant is painted in muted shades of earth—but there are indulgences to be had on the plate. 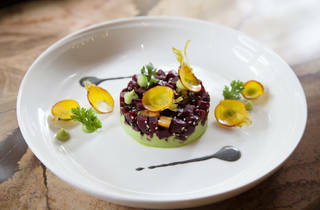 Unlike many vegetarian efforts, chef Alex Aparicio’s cooking sidesteps any veg-as-meat posturing. 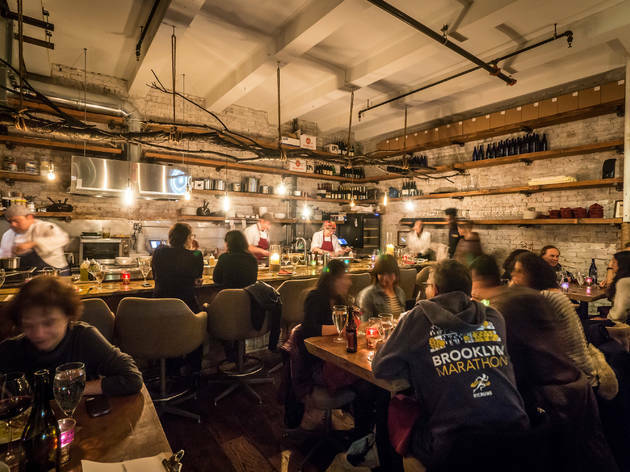 Rather, produce is allowed to speak for itself. 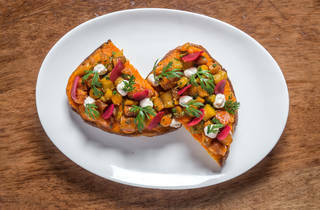 The closest to that trope is a puck of cubed pickled beets, the look of which is tartare but the taste is all taproot. 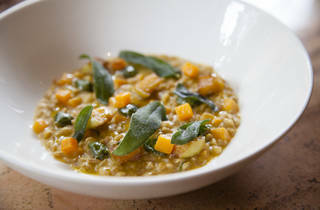 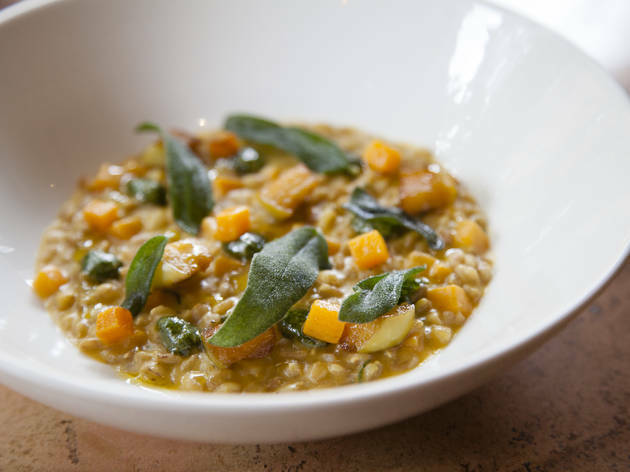 Soothing farro risotto, warmly autumnal with butternut squash and swirls of sage pesto, doubles down on the grain, popping with crispy kernels for unexpected crunch. 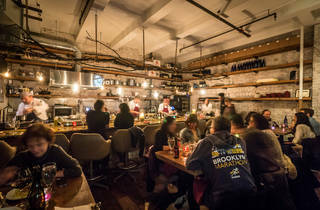 A tumble of funghi is a similarly effective showcase, with beefy king oysters and maitakes boosted by a drag of mushroom puree shot delightfully with smoked macadamia that had more than one perplexed diner asking, “Is there Gouda in this?” before being gently reminded that Gouda isn’t vegan. 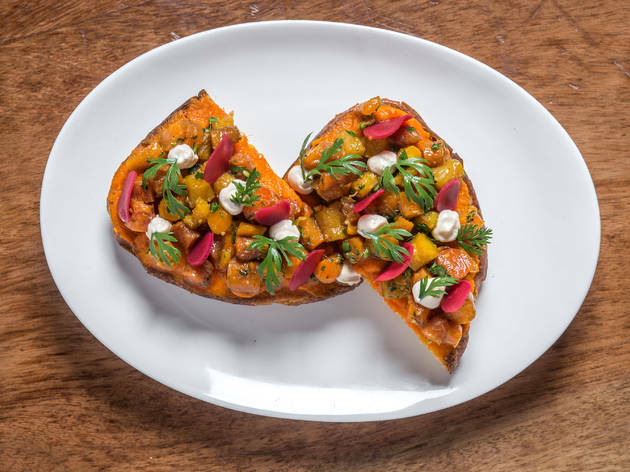 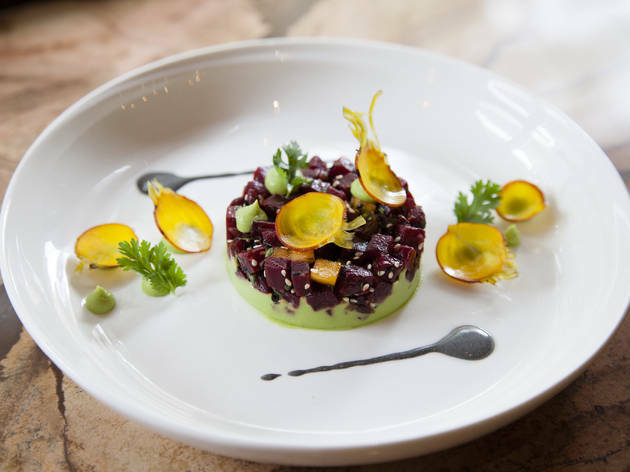 That might be Avant Garden’s biggest strength—it’s a vegan restaurant that puts as much import on the second half of that category as on the first.